The JTFlood2 is a High Flow pump station suitable for Flood relief applications. Job ready for easy installation. NovaBox Station for the collection and lifting of domestic waste water from the bath, sink, shower, and washing machine , dishwashers in basements, or below the sewer network in general. EGO 500 Auto " Puddle Sucker " Cellar Pump..... 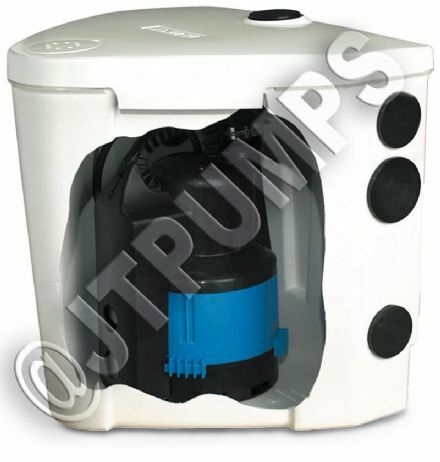 Unique to JTPumps Pre- Setup Auto start Levels Start 3mm Stop 1mm..... Low suction applications These 240/1/50 pumps are designed for handling clean or slightly polluted water. They feature an electronic adjustable Start/Stop facility, making them particularly useful for tight sump and low level (down to 1mm) pumping applications. This Single JTFS Basement 600L Pumping Station is a pre-assembled, ready to use package pumping station suitable for the handling of clean, grey or effluent water. This Single JTFS Effluent 450L Pumping Station is a pre-assembled, ready to use package pumping station suitable for the handling of clean, grey or effluent water. This Single JTFS Effluent 600L Pumping Station is a pre-assembled, ready to use package pumping station suitable for the handling of clean, grey or effluent water. This Single JTFS Basement 300L Pumping Station is a pre-assembled, ready to use package pumping station suitable for the handling of clean, grey or effluent water. This Single JTFS Basement 450L Pumping Station is a pre-assembled, ready to use package pumping station suitable for the handling of clean, grey or effluent water. This Single JTFS Effluent 300L Pumping Station is a pre-assembled, ready to use package pumping station suitable for the handling of clean, grey or effluent water. Where a basement or cellar has flooded, it may be impossible for the water to escape through conventional drainage. As the lowest point in the surrounding land, simple gravity flow will not remove the water – it will need to be pumped out. In these situations, a basement pump or full basement pumping station may be the best solution, allowing you to quickly remove unwanted floodwaters & groundwater from your basement. These pumps and pumping stations come as pre-packaged basement pumps, so you won’t need to worry about wasting time putting the pump together or sourcing the individual components when your basement or cellar is flooded. The Single and Twin JTFS Effluent pumps which are currently for sale on JT Pumps are specialist pump systems which, thanks to their compact size and convenient pre-packaged nature, makes them perfect for use as basement pumping stations. Originally designed as effluent pumps for removing grey or slightly polluted waste water, these pumps can handle bodies within the suspension of up to 5mm, which often thwart other pumping efforts. Thanks to their small size and the fact that they were designed for civilian use with septic tanks and other below-ground sumps, they are the perfect choice for pumping out flooded cellars and basements, or pumping rainwater out of areas where it has gathered. The other options available include the JT Pumps Flood and Storm Pumping Station, which is a basement pump that has been specially designed with high flow rates to mitigate the effects of flooding and eliminate flood waters quickly.